If you live in the Hamilton area and are looking for motorcycles for sale in Hamilton, be sure to visit our Budds’ BMW Motorrad dealership in Oakville. We have an excellent selection of new and pre-owned motorcycles for you to choose from, and you can begin your journey right from the comfort of your own home! Our online gallery is user and mobile-friendly, as well as interactive so that you can have an idea of what it looks like to drive one of our premium BMW motorcycles. However, the most important part of the journey to finding the motorcycle of your dreams is coming to our Oakville dealership and test driving one of our top quality bikes. We understand the importance of our clients getting a feel for how these powerful machines drive, and that’s why we really encourage you to come take one of our bikes for a spin any time! Your search for motorcycles for sale shouldn’t be a daunting experience, so at Budds’ BMW Motorrad we do our best to make your experience with us fun, educational, and memorable. We are here to assist you in bringing home the motorcycle you’ve always been dreaming of. Whether you are looking to purchase a brand new or pre-owned motorcycle, we have financial assistance programs that can help you bring home your dream motorcycle. We have an easy 3-step program that can be found in the 3asy Ride tab in our Motorcycles menu on our website. Simply choose a down payment that fits your financial situation and will allow you to decrease your monthly payment, choose fixed monthly financing rates, and find our convenient end of term options. 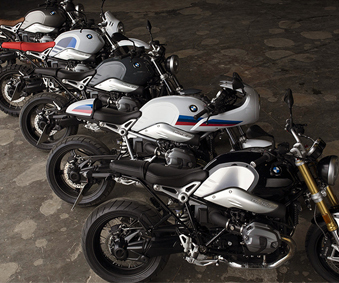 At the end of your term, you also have the opportunity to return your BMW Motorrad with the option of selecting a brand new model. Whether you live in Hamilton or in the surrounding area, our Budds’ BMW Motorrad Oakville dealership is just a short drive away. Feel free to browse our selection of sport, tour, and heritage series, as well as our adventure series and our roadsters. Once you’ve done your online search for motorcycles for sale in Hamilton on our Budds’ Motorrad website, feel free to book an appointment to test drive any of our premium high performance motorcycles at your convenience. Our friendly and knowledgeable team of client representatives are always happy to have you drive our vehicles, and of course to educate you on these powerful machines. If you prefer to speak with one of our representatives directly, feel free to call us and ask any questions you may have. We are here to make your experience finding new or pre-owned motorcycles for sale in the Hamilton area a positive one. Visit us today at our Budds’ Motorrad dealership in Oakville.